Illustrated applied cover, "tell a tale books" illustrated by Florence Sarah Winship. The story of Santa Claus visiting on Christmas Eve. Beautifully illustrated in full color. And this story book from me." The Easter Bunny is holding the book entitled "Peter Rabbit has Hardwork to Believe his Eyes," by Thornton W Burgess. The little book tells the story of an adventure Peter Rabbit has in the woods, and what he sees there he can hardly believe! The tiny book is 12pp, and in addition to the vibrantly illustrated cover, there are three (3) other illustrations, two (2) in color and one (1) in black and white. The back of the card has 10EC484 printed on it. Measures 5 1/2" x 3 1/2" . Minor edge wear. "Nana" has been written on the front. There is some glue staining on the back of the card as it was most likely pasted into an album at one point. Otherwise fine. A vibrantly colored unpaginated chidren's Christmas activity book complients of N. Snellenburg & Co. and Santa Claus...Printed on pulp or short fiber paper. Six (6) color pages, remainder black and white line drawings.s Begins with verse A Visit to Toyland by Maud Wood Henry, followed by story presented in the form of connect the dots, illustrations of Children of Many Lands, Christmas Eve by Emily Linslev, nursery stories Dear Santa Claus by Bessie M. Guigon, a Do-Somehting family sotry by Ruth Morton, Her Christmas Stockings by Lena B. Ellingwood, etc. It concludes with a Christmas Wishes rebus by Isla Paschal Richardson on inside back cover. Illustration of Santa Claus holding exterior of N. Sneelenburg & Co exterior, captioned "My headquarters". Meausres 8" x 11". 6 leaves with applied cutout puzzle pieces. Pictorial wraps 9 1/4" x 10 1/2".. Instructions on inside cover. Depicts busy midway with vendors and acts, farm life, the seashore, the zoo,the flower mart and the train station. Back inside cover promotes other books in the series. Outer cover promotes the Warne's Nursery Literature books. 22 unnumbered pp. color illustrated hard cover. Beautiful detailed color and black and white illustrations by author. Pookie the rabbit with wings sees Santa Claus and his dilemma trying to convince his friends. Part of Pookie series, first printing 1953. Measures 8" x 10". light wear on cover edges, slight loosening of binding, small amount of foxing beginning on some pages but intact pages with no tears. 8 pp unnumbered. Litho on tan, heavy stock wrap. Illustrations throughout by Margaret Evans Price. Part three color, part full color. 7" x 13 3/4". OCLC- 0 (Oct, 2018). 30pp . wraps. 9 full page relevant color illustrations (1 is centerfold). Illustrations by Helen Chamberlin. The story of Santa Claus' desire to have a son when he suddenly appeared in the room. He named him SANTASON who behaved and performed perfectly, just as Santa would. Well accepted by the elves, especially SOLEM-NOME, DROLL-DOLL-NOME and DRESS-UPNOME. They celebrate with a totem pole dance and a party. SANTASON helped with preparation of toys and eventually Santa asked his son to accompany him on Christmas Eve. Santa surprised SANTASON with a new plane and life was good... The story concludes with the author suggesting that children embrace and love SANTASON as much as they love Santa. (Guess it didn't catch on...) The back cover indicates it was given as a souvenir at SANTASON’S first visit to America by The Rike-Kumler Company. Dayton OH. Measures 9 1/4" x 6". OCLC - 1. The Rike-Kumler Company was a department store in Dayton Ohio. 32 pp. Green cover with red applied with red dust jacket. Two color illustration by Jean McConnell. Story about Little Elephant's Christmas day. Fourth Printing. Copyright 1938. Measures 9 1/2" x 7". cover solid, dust jacket tearing on edges and spine, pages intact with slight edge toning. , Three pages have small edge tears. bookseller tag "Wright's Drug Store, Picton, Ontario". Fine Victorian Christmas Scraps. ..
A 7" x 6" intact embossed die-cut scrap sheet depicting two Victorian Christmas scenes. The first a scene of children delivering Christmas treats to Grandmother as proud parents look on. The second is children seated around the children's table with an assortment of goodies including a plum pudding. Surrounded by leaf and gold ladder border decoration. .
Unpaginated. Black stamped board book. Profusely illustrated. In-text illustrations throughout. With the freezing wind blowing and the snow flying, Eloise, Nanny and Weenie arrive in Moscow. This first edition was published in 1959 at the height of the Cold War and unavailable for nearly 40 years, Two-color illustrations. Plus double center fold pictorial map of Moscow in four-color. 12 1/2" x 9" with bold letters at the top reading "Santa Claus and I are prepared to show the most Satisfactory Line of Christmas Goods Ever Shown in Town" with a vignette at left of Santa about to descend the chimney while the reindeer look on. Doors open at 7 o'clock in the morning (don't come before!). Promoting December 15th as "opening day' for the holiday season. 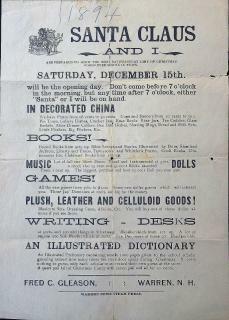 Promoted Decorated China, Books, Music, Dolls, Games, Plush, Leather and Celluloid Goods, Writing Desks and an Illustrated Dictionary. Of interest is "an Illustrated Dictionary containing nearly 1000 pages will be given to the school scholar guessing nearest how many times the store door opens during Christmas. It costs nothing to guess, only each scholar must record their own guess at the store." Fred C. Gleason, proprietor. Reverse is blank..
A 12 fold concertina book. Illustrated wraps. Picture book with rhyming verse, with a storyline similar to The Night Before Christmas. A brown coat St. Nicholas and dwarfs cutting down Christmas trees and driving St. Nicholas' sleigh. Measures 2 1/2" x 3 7/8". .